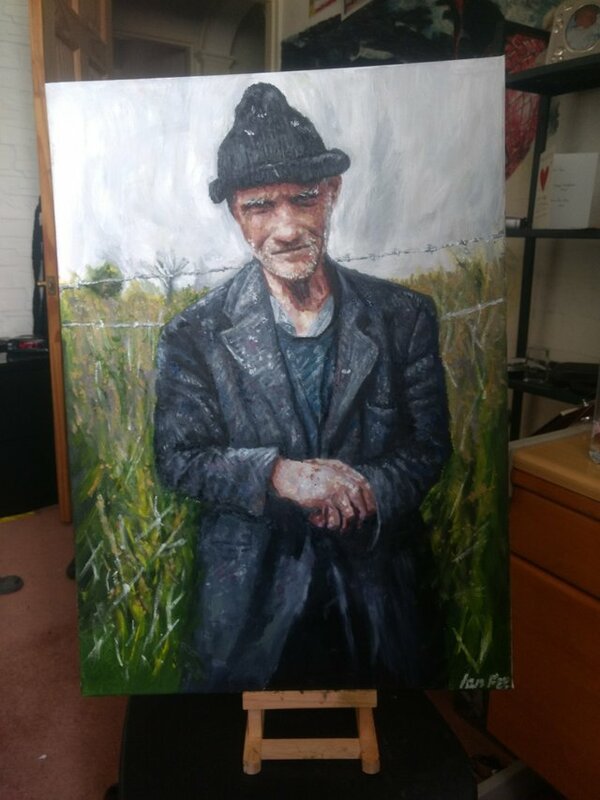 Work in Fields - Oil Painting my dad's cousin on canvas and sharing the process with you! Hi steemians, today I would like to share with you a final piece I have done for my project. My project was about creating art that moves people and I wanted my final piece to be a portrait that captured a lot of character and soul. I wanted it to tell a story through itself. 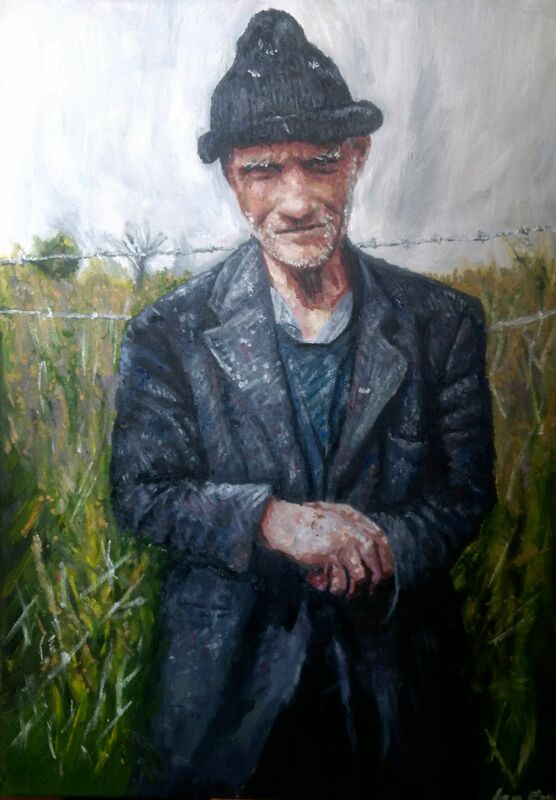 This is my dad's cousin who has worked in the fields all his life and part of the fashion in the past was to wear suits in the fields which he has carried on. I believe his posture, his facial expression, eyes and hands tell a lot about his life story and what his been through the past decades. I will share the process with you. Begin a pencil sketch on canvas to outline proportions. Using the reference photo on digital software I apply a posterize filter. 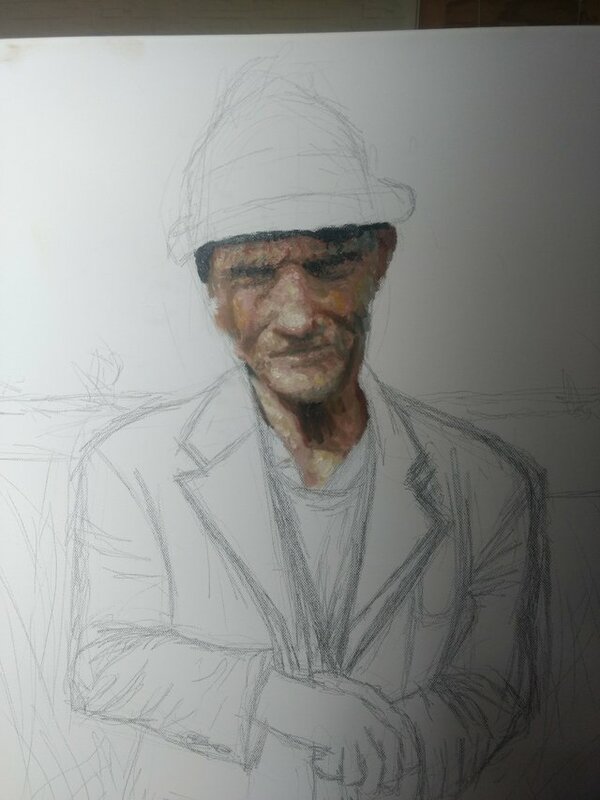 This simplifies it to a few basic colours I can work of when painting the face. 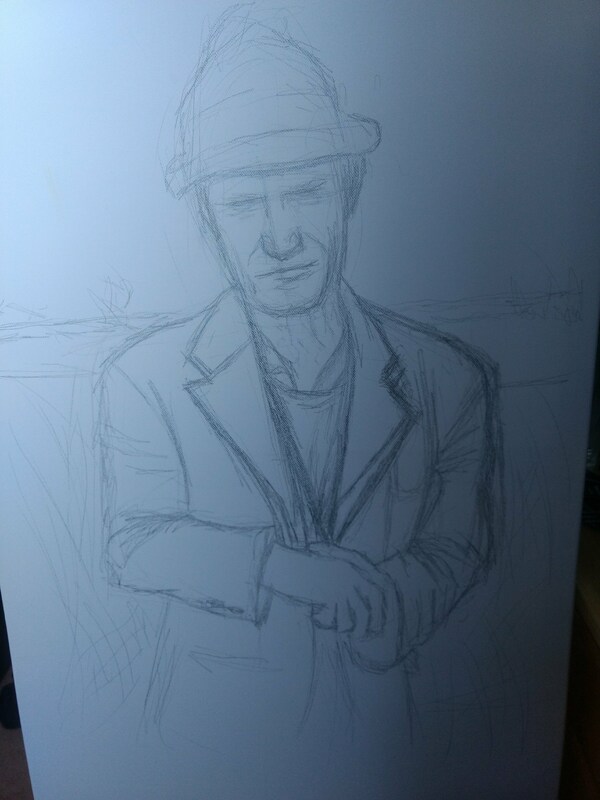 I then fill in the basic tones for the jacket. After adding to background, several more tones and details this was the final piece. Adding the black pupils, white beard hairs and eye brows really improved the piece and made it more real. The barbed wire in the background was also a nice addition to the painting. It was fairly difficult to get the right texture on the jacket, something I can improve in future. I also spent some time fixing the proportions such as the height of the shoulders and body width. Thanks for stopping by and all your appreciated support! This post has received a 4.82 % upvote from @booster thanks to: @iansart. Always great! Allow me to resteem it! it's just magical, I personally liked very much, and the guys probably! Great job brother. 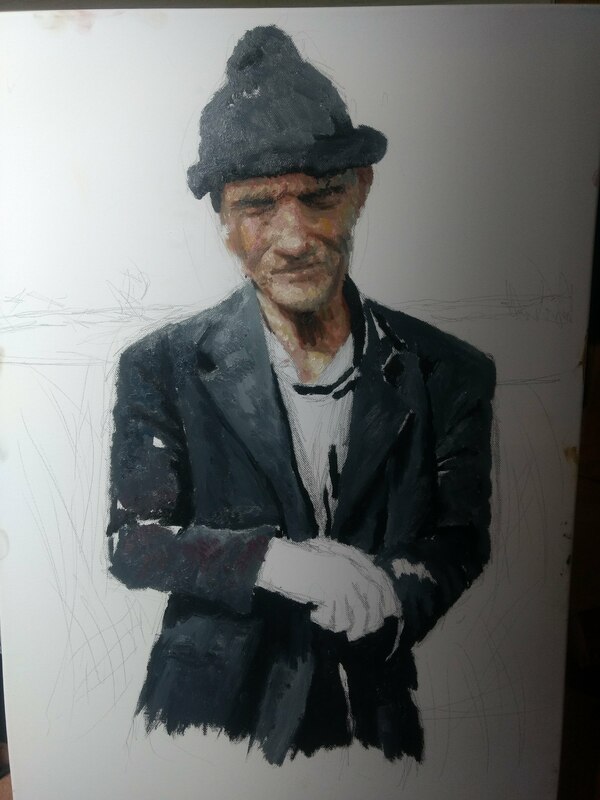 Well achieved the texture of the clothes and the expression of the eyes of man. Good work of glitters. Come to my blog to check my artworks. Your good I'll give u my vote. Thanks man appreciate the comment. wonderful painting, love it ! Beautiful painting Ian, you are very good in portrait painting, very warm feeling reflects the face, great combination of colors! I really enjoy your art. Thank you for sharing it. 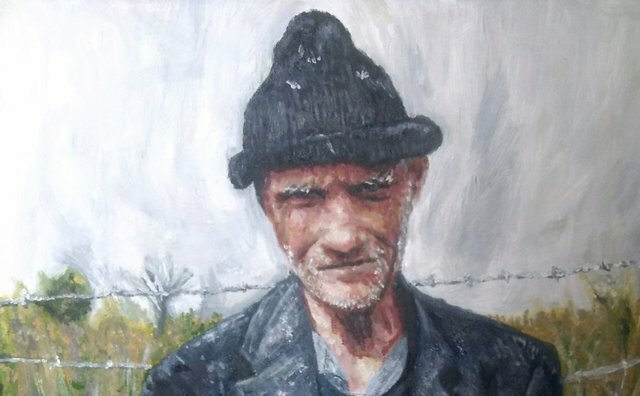 Very nice piece; a rustic man in a rustic setting. We can sense his loneliness and his introverted character.